Dear Cauliflower Wraps… you smell. In all honesty, these grain-free cauliflower wraps are worth a smelly kitchen. Very, very worth it. 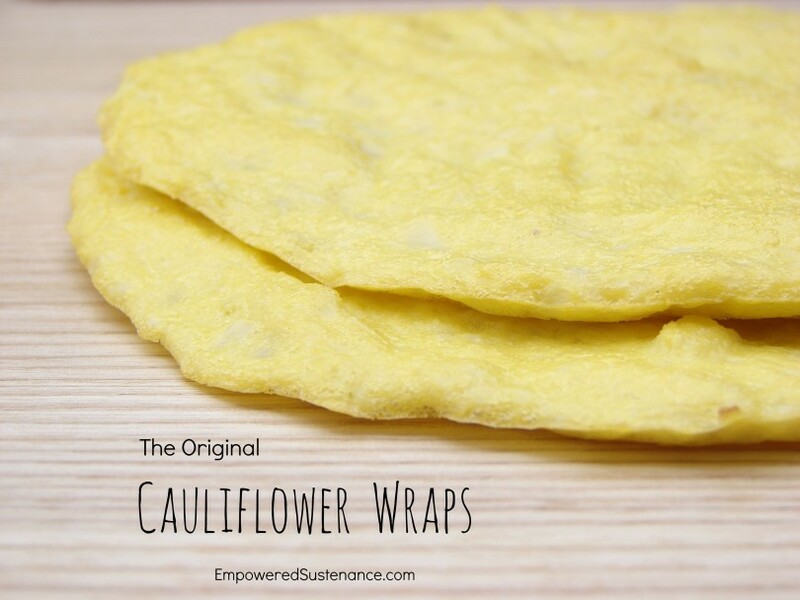 I recently began experimenting with a dairy free cauliflower crust and it eventually became these cauliflower wraps. I found that using extra egg in the dough created a pliable mixture which held together even when spread thinly on a baking sheet, even without cheese. The key here is “ricing” the raw cauliflower by pulsing it in a food processor creates these grain-sized crumbles. Then, steaming the crumbles softens them to create a tender wrap. Since I don’t use a microwave, I do this on the stove. However, if you choose to do this step in a microwave, it takes 7 minutes partially covered to cook in the microwave (according to numerous cauliflower pizza crust recipes). Next, squeeze out the excess moisture from the crumbles in a kitchen towel. It will significantly reduce in volume, but that is what we want! 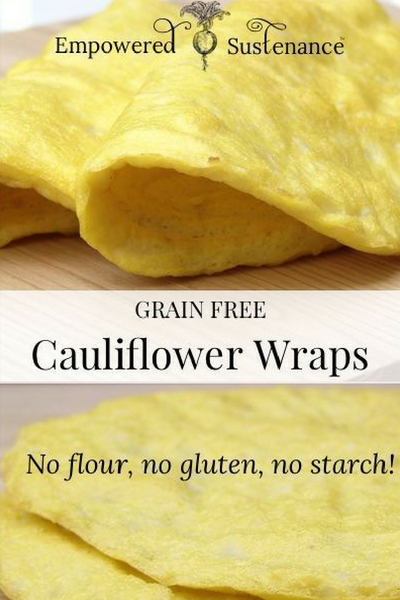 These cauliflower wraps taste delicious warm from the oven, but I can’t tell you how well they store in the fridge… they’ve never lasted that long! Preheat the oven to 375 and line two baking sheets with parchment paper. In a food processor, pulse the cauliflower florets until they form a crumb-like texture. Place the crumbles and ¼ cup water in a saucepan with a tight fitting lid. Cook on medium high heat for 8 minutes, until tender. Drain the cauliflower in a sieve, then transfer to a clean kitchen towel. Firmly squeeze any excess water from the cauliflower. In a bowl, stir together the cauliflower and remaining ingredients. Form two thin circles on the parchment-lined baking sheets. With a spatula, press down the "dough" so it forms a thin layer. Keep the wraps compact--there should be no parchment showing through the mixture in any area of the wrap. can this recipe be doubled/tripled exactly and turn out just as good? I didn’t receive a confirmation email. Anytime I want to do something it says I haven’t confirmed. I love the cauliflower wrap recipe. Can you just pan fry these instead of baking? This is great! Can 2 egg whites be used? HI, i like it, can u told us how many calories in. Hi. How many cups is for half cauliflower? There are different sizes. I bought mine in a prepackaged bag so how much cauliflower is in it? Can you tell us how many cups for the recipe? Thank you, Thank you for this recipe! I don’t use microwave oven as well & was looking for a recipe that didn’t use one. This is WONDERFUL!! I will use rosemary in mine w/ garlic! Just bought cauliflower at Farmers Mkt. yesterday so will try this recipe! YUM-m-m-m can hardly wait! These are delicious and super easy to make. I put fresh herbs in mine. Nice way of substituting bread products. I wish I could enclose a picture. ??? ?